The 2019 Ford Edge is all-new. It’s more stylish than ever, is more fuel efficient and powerful, and offers more passenger comfort. It also includes more standard features than ever, including new driver-assistive technology in a packaged known as Ford Co-Pilot360. In fact, it’s the first Ford SUV to offer Ford Co-Pilot360, and it’s found in absolutely every trim level. 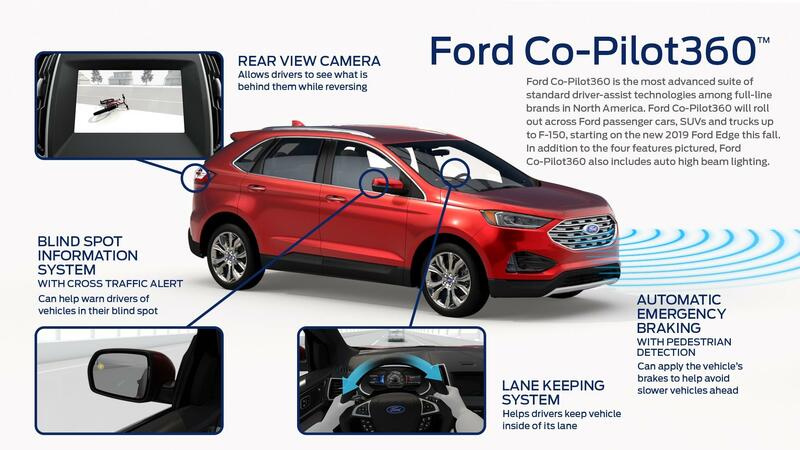 Learn more about Ford Co-Pilot360 features that you’ll get in the new 2019 Ford Edge, available at Southern California Ford dealers near you. Today’s Ford vehicles are better equipped to keep you and your passengers safe no matter the road conditions, and even if you momentarily lose focus on the road ahead. Ford is taking it further and making several driver-assist systems featuring standard-equipment in the 2019 Ford Edge in a package called Ford Co-Pilot360. Like a co-pilot, it’s designed to alert you to concerns around your vehicle that pose a risk. It’s 360-degree coverage you can count on. Keep in mind Ford Co-Pilot360 is meant to assist you, not take the place of driver focus and control. Ultimately, it’s the driver’s responsibility to maintain safe operation at all times. Five features comprise Ford Co-Pilot360 for the 2019 Ford Edge. See what’s behind you before you start backing up. A rear-view camera reveals objects, obstacles, and people that may be in the way, so you can reverse safely every time. While it’s a relatively common feature on many Ford models, it’s a very important part of Ford Co-Pilot360. Sometimes, you can’t react fast enough. Fortunately, Co-Pilot360 helps you out when you drive your 2019 Ford Edge. Imagine there’s a car that cuts you off in traffic, some pedestrian walks into your path unexpectedly, or there’s an imminent collision. Automatic Emergency Braking flashes a warning on the display and sounds an alert. If you can’t react in time, it applies the brakes quickly to help you avoid a collision or mitigate the severity of an impact. A glance away from the road for a moment and you could be crossing lane markers. With Lane Keeping System, you’ll stay squarely between the lines. It vibrates the steering wheel to indicate a course correction is needed. It can provide steering torque to bring you back to the center of the lane. And if it seems you’re losing focus, Lane Keeping System can advise you it’s time for a break. Near misses from lane changes are a thing of the past with BLIS. Using radar to identify vehicles in your blind spot, BLIS indicates their presence with an indicator light on the side-view mirror. Ever forgotten your high beams on and gotten ‘flashed’? Or have you struggled to see the road ahead unnecessarily? Ford Co-Pilot360 includes auto high beams as part of the package. Your headlights will switch to low-beam when oncoming traffic is detected, and back to high-beam when the darkness requires it. It’s another way Ford is keeping drivers safe in the all-new 2019 Ford Edge. Experience the features of Ford Co-Pilot360 when you test drive a new Ford Edge at one of the Southern California Ford dealers.